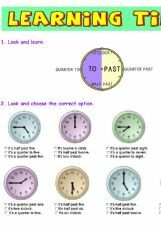 Multiple choice and write in exercises to practice telling the time with analog clock. Includes o´clock, half past, quarter to and quarter past. Great OE. Thanks for sharing.